Portable hard drives aren't that glamorous, but when Western Digital offered to send over a USB 3.0 hard drive, it mentioned something interesting - that it was aimed at students going back to school. A TV-style flashback then commenced as we remembered what it was like when we were doing our degree. Back then - if you're as old as us anyway - things were stored on floppy disks, CD writing wasn't affordable for most, and wasn't practical either for lots of reasons. If you did multimedia, as we did, then you might need to move huge music and video files around. The option, then, was a ZIP drive - remember those? An Iomega creation, it allowed you to move 120MB around on giant "floppy" disks. It wrote data over SCSI or parallel ports. Fast-forward to today, and you can move 2TB of data around on a device that costs half what a ZIP drive ever did. Welcome to the new world. Is the WD My Passport the ultimate storage solution? The WD Ultra is available in three different capacities: 500GB, 1TB or 2TB. There are also four colour options: black, blue, red and titanium. The 500GB is £49, the 1TB £65 and the 2TB £99 - not bad prices, but there will likely be cheaper USB 2.0 drives out there to tempt you if the slower transfer speeds aren't of the utmost importance for your needs. The My Passport drive itself doesn't have much in the way of physical features. There is the USB 3.0 socket, which will work with USB 2.0 connections too, should you not have a computer capable the latest USB format, and that is it. 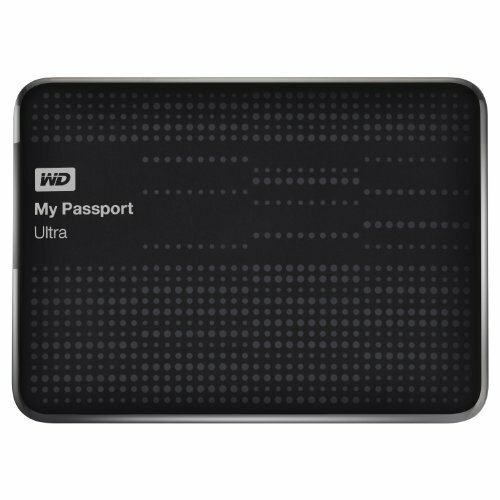 When it comes to speed, the WD My Passport Ultra really knows how to fly through transfers. We got speeds up to 112MB/s, which is just about as fast as we've seen on any drive. That's great given its small size and relative low price. USB 3.0 flash drives are quicker, but those have much lower capacity, and can cost a surprising amount of money. The lowest speed we saw was 60MB/s, although it's unclear why the speed dropped. It's possible that there was a problem with our machine, and that it couldn't read data quickly enough to send it to the drive, but we still found the performance to be impressive, even if the reported numbers had some variance in them. Our speed tests are performed on the 1TB model. A big reason to buy a portable drive like the WD is to backup important files. These days, with "ransomware" viruses around, it's really worth considering keeping precious documents and photos on a drive that isn't physically connected to your computer. If you haven't heard of the virus called CryptoLocker, spend a few minutes looking into it, it's very worth considering how safe your data is. Western Digital has its own back-up software, which seems pretty good. The problem is, it's free for 30 days, but after that period you have to pay for it. It is only £20, but that's still a big chunk of money relative to the cost of the drive. The software concept is simple: you can tell it to make back-ups of files at certain times, or when you start the process yourself. UPDATE: after we published this review Western Digital has got in touch to tell us that drive owners get three free licences for its backup software. If you want a decent - and free - alternative software solution then it's worth considering something like SyncToy which will allow you to run back-ups of folders, changing only files that have been modified, and keeping two folders synced to each other. It's a bit more complicated than WD's software, but it has the flexibility you need. It does need the drive to be mounted to the same "letter" each time though, so make sure you fix that in Windows' settings. Worst case though, just copy folders over when you want, and then disconnect the drive and put it somewhere safe. If a virus attacks you, then you're only ever going to need to reinstall your OS to clear the problem, with key files stored on your portable hard drive. Although it's not something we've tried to check by literally lobbing the My Passport around, it's always worth considering that portable hard drives are not fail-safes. They can and do break. That's why you should use it as a back-up device rather than the only location to store all of your files. We think it's best to also leave the drive at home, in a stationary position to avoid anything untoward happening to it. Cart it around in a bag all the time and chances are that you may eventually fall into issues. We've been through plenty of drives in our time, and that's not a criticism of Western Digital, it's just a comment on modern storage and back-up practices. The great thing about the WD Ultra is its raw transfer speed - USB 3.0 is fast. It's unusual that a portable hard drive impresses us in this regard, but the Ultra really did. It's got a decent capacity for a fair enough price point and you won't get cross copying files to it - and that's a massive advantage for a portable hard drive. It's also very simple. There are no extra power inputs or switches, simply plug it in and you're off. Everything you want in a portable storage device. Except, perhaps, for the additional back-up software at £20 a year - not an essential purchase, and something you can bypass with a free alternative as we did. Desktop hard drives will always be cheaper, though, so don't expect the kind of price you would get in a larger internal drive, but for moving lots of files about, and USB 3.0 speeds, we think the WD Ultra is reasonable. And remember, when Pocket-lint was at University, we were messing about with floppy disks and then ZIP drives, so this is luxury.